When it comes to every generation XY teenager who went through a Led Zeppelin phase, the reality of missing out on the 1960s was a tough pill to swallow. When Twin Peaks came into the picture, a bit of that leftover teenage angst was eased. No doubt by now you’re familiar with the Chicago based (sometimes) five-piece who have made a name for their DIY spin on high energy ’60s garage rock and rowdy live shows. Their flair for working the elements of such an iconic decade into consistently fresh tracks has earned them a devoted following since they emerged in 2013 with Sunken—though their history dates back to high school basement jam sessions. 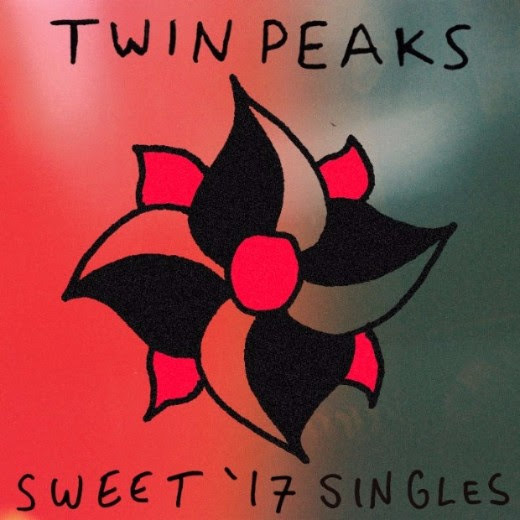 Besides holding down a full time tour for their 2016 record Down In Heaven, Twin Peaks are simultaneously working their way through releasing six months of singles , the sum of which will comprise their Sweet ’17 Singles series. The project will complete in December as a 12-song album that grants the band creative flexibility while resulting in a unified body of work. Of course, it also means we get consistently new Twin Peaks for a few more months! We all win. With nearly all the band’s members supplying lead vocals at one time or another throughout their discography, Clay Frankel nailing a Jagger mockney accent on one track and Lake James taking on a dryer intonation on others, the instrumentals on “Tossing Tears” drive the song over Lake James’ dynamic chops – his vocals landing somewhere between animated and toned down, to the confused and even hopeless lyrical vibe of the track. Whatever the words’ implications, the melody is reassuringly lighthearted and sorts “Tossing Tears” as a track that’s nothing if not optimistic. “Under the Pines” is the day drunk, idyllic B-side to “Tossing Tears.” A twangy jam, headlined by Frankel’s unmistakable vocals and seamed in with some sweet saxophone, is an ode to the good things in life: summertime, wine, and checking boxes off your sexual bucket list—an apt release for the height of summer. Things mellow out in August with “Sun and the Trees” and “Shake Your Lonely”—two tracks that tend toward the melancholic, at least by Twin Peaks standards, but that doesn’t curb their enjoyment. “Sun and the Trees” is a rolling, instrumental-lead track that, despite a single woeful verse, runs 3.5 minutes with some rosy instrumentals to balance it out. “Shake Your Lonely” on the A-side is a bluesier number highlighted with some sweet female vocals. So if you’re one of the forward thinking 300 who pre-ordered the Sweet ’17 Singles series 7” vinyl, feel at ease in your investment. If the running track list is any indication of the remaining 8 songs, we’re in for four more months of solid tunes from a few of Chicago’s finest.